Iran National Security Council tells Moussavi his complaints are "illogical"
TEHRAN, Iran (CNN) -- Members of Iran's influential National Security Council have told opposition leader Mir Hossein Moussavi that his repeated demands for the annulment of the June 12 election results are "illogical and unethical," state media reported. 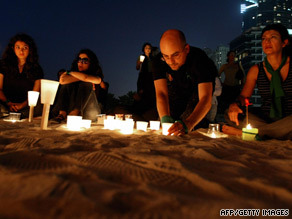 Iranians in Dubai hold a candlelight vigil Thursday for Neda Agha-Soltan, who was slain in election protests. Esmaeel Kowsari told the government-run Iranian Labor News Agency in an interview Friday that the council met with Moussavi, former presidential candidates Mehdi Karrubi and Mohsen Rezaie, and former Iran President Ali Akbar Hashemi Rafsanjani, who now chairs the Assembly of Experts. The assembly is responsible for appointing or removing the supreme leader. The National Security Council, which includes dozens of political leaders, assists Ayatollah Ali Khamenei, Iran's unelected supreme leader, Together, they set the parameters of regional and foreign policies, including relations with Western powers, and the country's nuclear programs. It was not clear when the Security Council meeting took place, but based on information from it, the NSC will prepare a report and make recommendations to parliament in light of the candidates' complaints, the Ministry of Interior, the Guardian Council and "higher levels," Kowsari told the news agency. Moussavi and Karrubi have consistently rejected the election that gave President Mahmoud Ahmadinejad a landslide victory as fraudulent, and demanded a new one. When Moussavi again pressed his case for an annulment, "We told him that it is not the way you think [you are wrong] and you must pursue your demands through legal channels," Kowsari said. But, unfortunately, he said, Moussavi's demands are based on "erroneous" information. Unconfirmed reports indicate that Moussavi might be under house arrest. Moussavi has sought to meet with his supporters in a public place such as the Azadi (Freedom) Stadium to discuss election issues. He also would like to make a media appearance. The stadium has a capacity of 100,000. According to ILNA, Tehran's temporary Friday prayer leader said, "I ask the Judiciary to deal firmly and mercilessly with the heads of the riot, whose heads are in the U.S. and Israel's stable, so that it would be a good lesson for all." Kowsari quoted Moussavi as telling the council that the daily street protests haven't been carried out on his behalf, "but we [the council] told him that his declarations have invited people to riot."